Like most little girls, Big Tot likes to play at Princesses, and has been trying out the Tube Town Princess Castle by Disney. So, did our little Princess give it a thumbs up or was it off with Disney's head? Lets find out! The first surprising element to the Tube Town Castle is the weight when in the box. I obviously knew it would be quite big as it has to fit a child in, but its a great size, and easily fitted both the Tots inside. Its big and pink too, which immediately made Big Tot happy- if it looks girlie then she loves it! But most things have a few days of number 1 in the toy chest (or in the case of this next to it!) and then Big Tot moves on to something else. In the case of the Castle, from her perspective, I think she'd live in it. In fact we've had a few tantrums as she has wanted to sleep in the castle in the living room rather than in bed! So from her viewpoint its a big thumbs up. She couldn't wait to tell her playschool friends that she owns a Castle- I had to explain to a few Mums that no, we hadn't bought a Country pad! In the end I had to take a photo, and now, well I think there will be a few more girls with these after Christmas thanks to Big Tots constant chat about it! From the parents perspective, it looks like it will be difficult to inflate- we had a blow up couch in the summer which took forever with a foot pump! But thats the clever part about the castle. Once out the box and unfolded, you simply attach the special pump, and in under a minute its ready to use. Yes, you did read that right- under a minute! So no arduous foot pump work needed, only for the child to decide, after an hour of effort that they'll go play with something else! It also means that if you have only a small amount of living space and have to practise a "play with one toy at a time" policy, then this is ideal, as it folds up really flat and deflates easily too. It can be moved about with ease- you expect it to be heavy as it is when its deflated in the box, but when blown up its weighty enough to not be moveable for a child but not so much for an adult. The combination of 90% polyester and 10% PVC ensure that it is strong, and can obviously be repaired with a puncture kit should the worst happen in the same way as an air bed or paddling pool. It can used both indoors or out, and comes with pegs for keeping it in the ground like a tent! 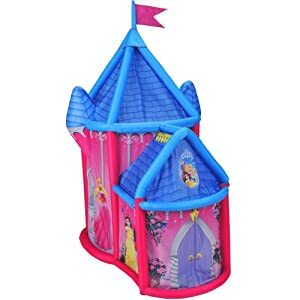 It comes in at £80, which is more expensive than standard playhouses, but considering its suitable for indoors and out, can be inflated and deflated quickly, and its Disney, I think its quite reasonable, and I think Big Tot would agree!